Here we go again, a new year has crept up on us and there is no change of course in sight. We began the year with another revelation concerning another scandal that Daphne Caruana Galizia had written about a long time ago: the arranged sale of three hospitals by a minister holding accounts in Panama to unknown people holding several accounts in shady places. But 2019 also started with another in the series of losses of heritage and degradations of our country, another example of the incestuous relationship that exists between a so-called Socialist government, represented by the minister with Panama accounts, and groups of land-grabbing oligarchs. Caravaggio’s famous painting of the conversion of St Paul in the church of Santa Maria del Popolo in Rome. There is still time for Joseph Muscat to turn the clock back, and like Saul on his way to Tarsus, to see the light. This minister is now so intimately connected with all the scandals of the past few years that there is always the suspicion of dirty business and under­hand payments in deals he is connected to. These range from the gas supply agreements and the sale of land at Żonqor and Cospicua for a pseudo university, to the sale of hospitals to Vitals and the cross payments to unknown individuals – friends of our Panama boys – apparently owning rights to Vitals. I would not be surprised if the Gozo tunnel project is another cow to be milked by the likes of this minister. All this with the approval of our Prime Minister and a majority in the Cabinet. I say the majority because cracks have appeared, even in Cabinet. As ministers vie to take over once the Prime Minister decides to cut and run, two minis­ters in particular seem to fear being burnt by the revelations coming out of the hospital scandal. These are the Minister of Finance, who paid the millions from our national coffers to the shady figures behind the Vitals veil, and the Minister of Health, whose department has lost assets and now has to deal with a new hospitals owner from the ultra-capitalist and uncaring American health care system. The latest deal tainted with the incestuous oligarch-government love affair is the award of land and seabed rights to a company that had always appear­ed to be specialists in the hospitality business with clear intentions to raise the quality of tourism in Malta. Et tu Brute? This company seems to have been infected with the Sandro Chetcuti bug of making hay while the sun shines and has joined the bandwagon of Fenech, Gasan, Debono, Zammit Tabona et al to create real estate schemes that entail the building of Dubai-like towers and Dubai-like reclaimed islands to cater for those wishing to hide their millions. Building towers in Pembroke and St George’s is as bad as building towers in Tigné and Qui-si-Sana, Gżira, Manoel Island and Mrieħel. But the attempt to find other sites to dump the rubble from the tunnel between Malta and Gozo amounts to a conspiracy to aid and abet the destruction of Gozo, now that Malta is three-quarters of the way to being terminally destroyed. No, 2019 has not started well. Add to this the preposterous attempts of some members of the judiciary to use false syllogisms, tautological arguments and creative interpretations of the law to protect the party in power, and the bottom of the barrel has been reached, our last hopes vanishing into thin air. Are they feeling that their recent increase in salary was a quid pro quo? Or are they simply afraid? If they are afraid I may have some sympathy but no respect for my legal colleagues. During Mintoff’s reign of terror we did have judges who stood their ground and applied the law in spite of violence having been applied to them, their property and families. Like Cassandra I do see change in my crystal ball, and like her I will admonish the present government to stop the rot before the rot stops them. I recently attended the commemoration of the 15th month of the failure of the justice system to find out who ordered the murder of Daphne Caruana Gali­zia. Once again, a few hundred gathered, believers in civil socie­ty’s right to clamour for free speech, liberty and justice, and to complain about the volte face that the young, idealistic socialist Joseph Muscat made from the position of disgust and disapproval he had taken against the violence, corruption and fear of the Mintoff days, when his own party had broken all the rules of a democratic society. Back then he was vocal but today he shows fear of public appearances. He fails to put distance between himself and the attacks by members of his Cabinet on protestors. He supports those in his government who hold secret accounts in Panama. He promotes shady deals with pretend universities and with land grabbers. He approves power station transactions that break all the norms of correct practice. He sells passports to fugitives from regimes that actually forbid the holding of double citizenship. He transacts the sale of Malta’s precious health care assets and plans for a needless Gozo tunnel… the list could go on. If he is not involved himself then he has completely gone back on the youthful ideals he express­ed in his journalistic days. And he has reneged on his 2013 election platform campaigns and slogans about transparency, meritocracy, accountability and care for the weaker in society. If he is involved in asset robberies then there is no salvation. But if he is, like the rest of us, a victim and a hostage to the activities of others, then he must recall that even Mintoff had a moment of repentance in his later years, when he worked hard behind the scenes to find a solution, with Guido de Marco and others, to the impasse of the years 1982 to 1987, and again in 1998 when he toppled the Labour government of Alfred Sant and helped bring Malta back on track towards EU membership. Just like his predecessor, whom he admires enough to place his statue just outside his office window at Castille, Muscat could make a U-turn and go down in history not as the destroyer of our culture and our built heritage, and of our reputation in the world, and not as a blind believer in future technology without a caring heart for the weaker in society, but as a true Socialist, a true lover of Malta and the Maltese; not as a super-cosmopolitan but as a moderate, nationalist politician with cosmopolitan openness; not as a purveyor of fake news but as a believer in truth and justice; not as a concealer of the truth behind the murder of Caruana Galizia but as a revealer of the person or people who ordered her to be killed. 2019 is still very long. There is still time for Muscat to make it a happy, prosperous and peaceful New Year. My wish is that he relents and finds his own true self as I remember him: as an MEP in Brussels when I worked there and had occasion to cross paths with him. There is still time for Muscat to turn the clock back and to be like Saul on his way to Tarsus, to see the light. 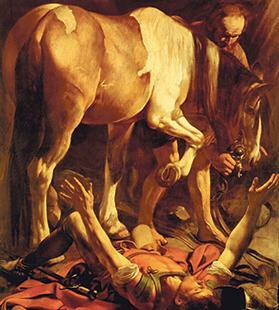 The Caravaggio in the church of Santa Maria del Popolo in Rome comes to mind, depicting that famous evangelical conversion with the hind quarters of the horse dominating the scene of the falling and blinded Saul. If Muscat does not do a Saul, I am afraid we will only have the hind quarters of the horse and what that produces to remember him by after he retires to enjoy his trophies in the coming years.